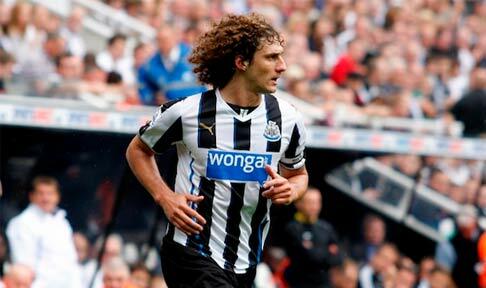 Does Coloccini’s commitment to Newcastle signal bear significance? Words by Kevin Doocey on May 6, 2014 . In a timely boost for all associated with Newcastle United, captain Fabricio Coloccini today confirmed that he will be staying at St. James’ Park for next season, at least. The Argentinian centre-back was widely expected to depart Tyneside for a return to his home nation, but all has been put to bed as the ball-playing defender announced to the Shields Gazette that he is already looking forward to the next campaign in a Newcastle jersey. It is worth noting that despite the undoubted positive news this represents for the club, the only team that looked to sign Fabricio, San Lorenzo, parted company with one of their employees, who also happened to be Coloccini’s father; Osvaldo earlier this year. One would have to assume that any potential move to the Buenos Aires outfit is now almost definitely off as his father was a leading influence in trying to seal a move for the ex-Deportivo man. Now, while his commitment may be out of necessity (lack of any forthcoming move) more than anything, it is still good to have our captain speak of his future at the club. My question is, does this signal an agreement between the club and Fabricio that represents something significant? Two weeks ago many outlets reported discussions between Coloccini and the board, and how they guaranteed the Argentina international that there would be significant expenditure and player recruitment in the summer. While that is hard to believe, maybe Colo knows a good bit more about the plans of the club than us supporters do. At 32 years-old, Coloccini has a couple of more years at the top level and maybe that is another reason behind his stay - he is going to enjoy the Premier League and the fine pay-packet he takes home each weekend before departing to wind down his career. Thoughts welcome folks, follow me on Twitter @KevinDoocey and make sure to like Tyne Time’s Facebook! My theory... Ashley has offered him a player-manager position when P45dew is sent packing. Makes sense as... 1. Colo &amp; Ashley met up the other day. 2. All of a sudden he's happy to stay even though we know there will be little investment in the team. 3. As an experienced international he'd have respect of the players. 4. Ashley would save money as he'd have one person doing two jobs. Well that's certainly an interesting theory! Ashley communicates ! Appoints Lennon from Celtic to give nous, inspiration and commitment. It would like a 3rd coming except the new entertainers would have someone who not only knows how to roll-over big teams but how to get over the line. A winner with the players, the fans and the marketing men and get the £'s rolling in! From the comment below regarding the appointment of lennon from celtic. I like it! I’ve never thought of him as toon boss until now, and I reckon it isn’t that far from possible. Surely he’d be keen for a change now, must be boring easily winning the league every season, and they are only ever realistically capable of winning the second tier European comp and that’s only when the don’t sell their best players, which they’ve been doing recently – wanyama etc. Lennon might work you know, and id take a shot with him over Pulis anyday. Happy to hear colo is staying too, one less player to replace – C’Ashley will be pleased. Lennon? Are you kidding? What relevant experience does he have? Bit of a difference between climbing onto the favourite in a one horse race and stepping into the 7th pit of hell at SJP with little in the way of success, players or money. What has he actually done that suggests he could do the job? Moyes would be my pick. His success and consistency at Everton with nothing to spend have shown that he knows what graft is all about. Nope not kidding, and moyes would still be my top pick too, but Lennon would be worth the gamble. What’s he done to deserve it? Oh how about winning like 7 league titles, 9 cups, and having some pretty decent runs in Europe. That’s pretty good experience in my book, maybe even better than moyes, albeit Lennon in a much easier league. Financially, celtic don’t spend much either – no one decent ever wants to play there, so very similar to toon in that regard. I see moyes and lennon as being pretty similar, hard nosed, no nonsense kind of guys that would get the players busting their hump, which is well overdue. If moyes wasn’t keen, I wouldnt be too upset to have lennon come on board. Neil Lennon would also make my shortlist for the next manager. Would bring passion, and Champions League experience with him. Has played at the top level, and his style of football with Celtic is encouraging. Going to make an article out of Neil Lennon and post it next; the pros and the cons of his potential appointment.